In a hurry for your prints? Our Photosmart C6180 is the world's fastest photo All-in-One! 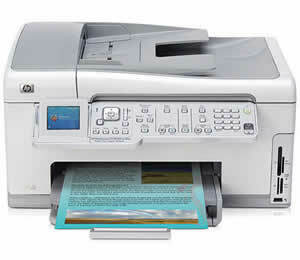 It's also a pro at color faxing, it uses six separate ink cartridges that you only replace as needed. With built-in wireless networking, it's ready for connecting to all your home PCs. More time savers: the 50-sheet automatic document feeder and 4 x 6" automated tray for dedicated photo printing. This page is part of GeneralManual.Com Network HP Photosmart C6180 All-in-One User Manual.